It's May and in our family, this month is packed with celebrations. Birthdays, holidays, anniversaries, you name it. Many of us are either Taurus or Gemini and we also have relatives who have passed born in this month. For instance, my late mother was born in May and so was my sister. I was born on my grandmother's birthday at the end of the month. Then a son-in-law joined us and he was also born in May. And I must add that my very first novel was published in May the same week my son was married. Coincidence? I don't know, but there's a lot going on!! My mother passed away many, many years ago from complications of alcoholism. I can honestly say I don't miss her. It was a rough time growing up. She and my father moved to Brazil for his job and she died there. I don't even know where she's buried--or if she was buried. It's like an unfinished book. None of this means I didn't love her or forgive her. I did. But I made sure my children had a mom who was 100% there for them. So, in the beginning I didn't know how to be a good mom but I found my way. I succeeded. I am close with my kids. We love each other very much. Mother's Day is a true celebration. Even if you didn't have the best mother, you all had one. It's a tough job and some of them fail. But I have come to believe that a child has unconditional love for their mother even though sometimes it's complicated. Most of you out there probably were wonderful mothers because you were taught well! I applaud you and hope you have a fantastic day. May has a tendency to make me a little down because I have a tendency to feel the loss of my mom more strongly. Her birthday and Mother's Day usually share the same week - and you can't get away from hearing about Mother's Day for weeks before the day. I have no kids myself (except for my furry ones), so the day is just more of something I prefer to get past. So sorry May is rough for you. But you learned to be a great mom to your kids because of your mother. She passed on something special. If those kitties could all buy you a mother's da card, you wouldn't have room for them all! Good luck with the kitty, Leann! We have two sick kitties here, so lots of vet visits on the horizon. In one case (Henry) it might just be allergies. I didn't even know that indoor cats could be trouble with allergies (?) but apparently they can. No idea what the treatment is. Taking Henry in first thing tomorrow morning. Leann, there are many of us out here who had mothers who were not interested in the job. I have tried to overcome the lack of knowledge about what is a good mom. 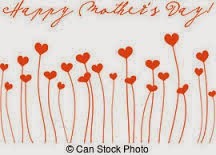 I hope you have a wonderful Mother's Day. Hope your grandkitty gets better. You know it can be as difficult to find a wonderful vet as it might be to find a doctor who is a good fit for ourselves. Hope every Mother's Day is as lovely as pizza with those you love and who love you. Leann---your blog was very powerful and made me cry. My dad was the alcoholic and gambler, but my mom was the strong one. An early feminist (equal pay for equal work), staunch Democrat in a very Republican community, and a traveler who always wanted to know what was beyond the mountains. She's been gone 10 years in August and mentally for about 5 years before that, but I still miss her. I'm so glad for you and your kids that you were determined not to be your mother. And this is a note for Mary---Yes, indoor cats can have allergies. We tested Spats when he was very young and found 29 including all of the common flavors of food and brewer's yeast which is in most brands. Allergens are still in the air. For years I've given him two shots (subcu) a month plus buying special food from the vet which is very expensive. Thanks Annette. It's a good day! And I will get a status update on poor kitty later today. She'll get a better doc since NYC is loaded with all sorts of good ones! Hope you have a wonderful day as well! Thanks Cordella! Looks like you hit the mom lottery. Celebrate her spirit. Some of us lost our mothers at a very young age & didn't have a good role model it made me try harder to do my best for my girls. Love, wisdom & just being there counts for a whole lot.